Ah, Las Vegas. The land capital of bottle service. It’s the only city where more appearance money goes to those bearing names beginning with the letter “K” than in all of Los Angeles. Okay, maybe not. But still, if not for the hosted media trip, I couldn’t help but wonder if I’d just otherwise resign to bourbon, neat, for the duration of the weekend. Having acquired a favorite Vegas bar from my Cochon 555 All-Stars trip a mere month prior to this, I became disappointedÂ in that very bar when my cocktail fell too sweet on my second visit. Though I know we were singled out as media guests, Sage came to our libational rescue. We were treated to a great selection of cocktails hand-crafted with boutique spirits and housemade bitters. They were riffs on classics with a seasonal twist, and I got the sense that their exciting cocktail menu is a constantly evolving list. 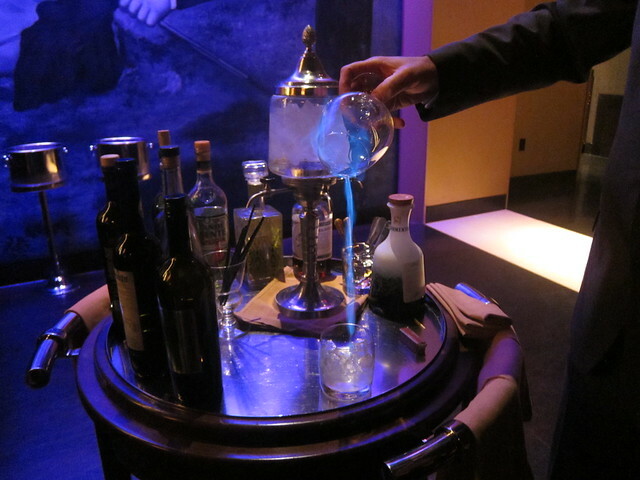 If you can get in for a demo, the Russian-style absinthe tasting is a delight for the senses. From the brilliant, violetÂ flame toÂ the whiff of licorice and aniseÂ and ultimately the light, herbal taste – it’s a great way to dispel all those tales of lore you heard about this spirit, which remains in a class all by itself. As for the cocktails, I surprisingly found myself loving the Tea Rose – made with tea-infused Death’s Door Vodka, St. Germain, lemon, rosewater and pinenuts. My favorite cocktail trended unsurprisingly towards the negroni-like Il Postino, with Plymouth Gin, Campari, Luxardo Maraschino and Averna. ButÂ I would be remiss toÂ take for granted a well-made negroni. Another favorite was the Smoking Bulleit, made with beautifully smoked peach-infusedÂ Bulleit Bourbon and finished off with mint and lemon.Â But the most original cocktail of the evening was non-traditional, The Artful Margarita, made with Oro de Blanco Tequila, Cointreau, Art in the Age Root Liqueur and lemon. It left the impression of a Sarsaparilla with its root liqueur. The cocktails displayed a sort of sophisticated simplicity in their recipes.Â We talked infusions with Michael Shetler, the Director of Beverages, and the differences between California and Nevada law (we’re a bit late to the legality of them, anyway). As far as beer, Sage also has a small but wise selection of drafts. 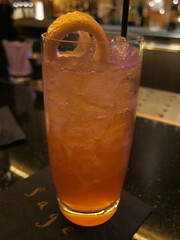 Sage is a great place for not only pre-dinner drinks (complete only with theÂ excellent food in the dining room) but as a serious Vegas cocktail destination. I know that when I land in Vegas again, I’ll definitely be back for a drink or two. Or more. 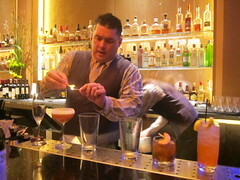 Two nights’ stay in suites, meals and cocktails at The Aria – including at Sage – were hosted. This entry was posted in cocktails, Late night, Travel and tagged absinthe, Aria, cocktails, demonstration, las vegas, Michael Shetler, nevada, Sage. Bookmark the permalink.